andl if you really want to do it right, you might sneak in a pint of vanilla ice cream too. 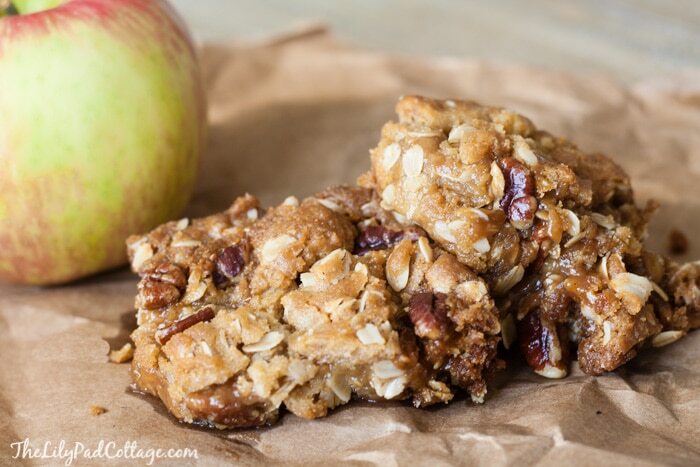 The best part is these Caramel Apple Oatmeal Bars are soooo easy to make. I’m telling you this pan will disappear in record time, my dad was just at my door a few minutes ago asking if I had any left! Saute apples in 1 tbsp butter over medium heat until softened, about 10 minutes. Sprinkle with ⅛ tsp of apple pie spice and pour jar of caramel sauce over top. 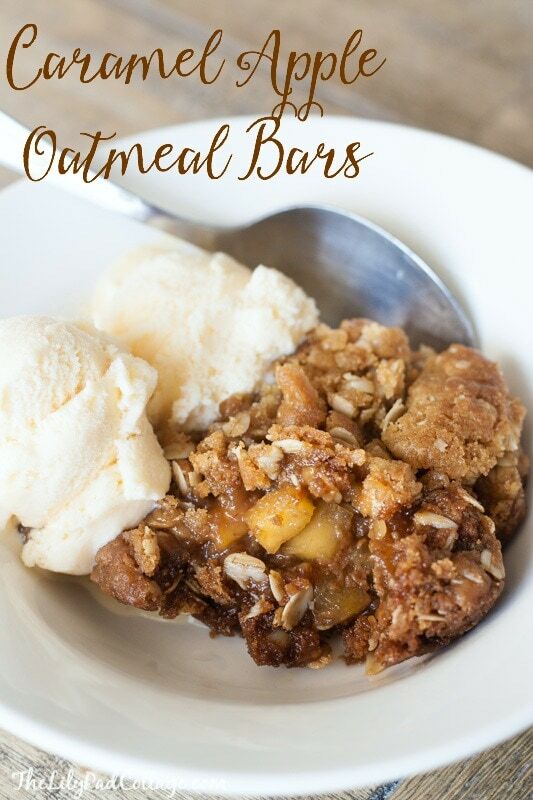 Mix melted butter, brown sugar, flour, oats, ⅛ tsp apple pie spice and baking soda in a bowl. Spread half the mixture in a greased 8x8 pan and bake at 350 for 10 minutes. Top with the caramel apple mixture. 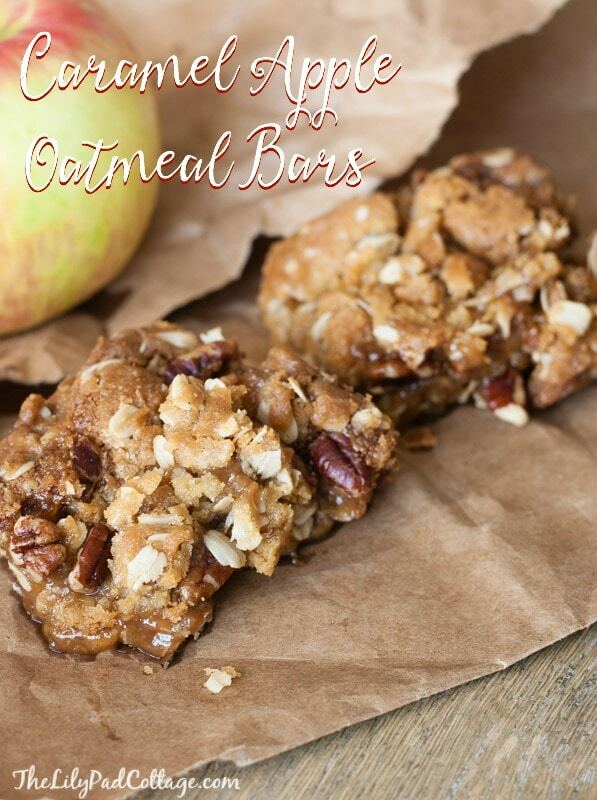 Sprinkle the remaining oatmeal mixture over the top and sprinkle with nuts. That certainly does look yummy! I’ll have to wait until we go visit our kids and grandkids because I WOULD gobble it all up and my metabolism isn’t what it used to be. You know, when you reach a (ahem) certain age you can’t enjoy as many goodies. Thank you for the recipe — it is a definite on my list. Can I ask what the actual amount if caramel sauce is? It was a 12 oz jar, sorry about that, I’ll have to edit the recipe to include that – thanks! I also have a question about the caramel sauce! The only kind of caramel sauce I can think of is the stuff you would put on ice cream, like Smuckers. Can you please tell me what brand & amount you used? Thanks, these sound DELISH! I was lucky enough to Be on the sharing end of these bars, they are amazing!! Seriously so good Kel! Your dad says he wants a pan of these for his birthday!! Sounds good, I’ll plan on it :) thanks mom! Hi, just wondering if you use regular oats or the quick oats?? Thanks! It’s been a while since I made this but I think I used the old fashioned kind!